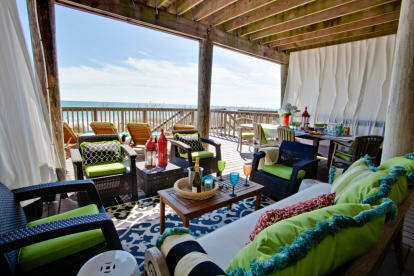 We’re glad you’re considering the Green Reef 19 townhome as your Destin beachfront rental! My husband Bill and I first stayed at the Green Reef complex as vacationers, after finding a words-only ad in the newspaper (ahhh, the good old pre-Internet days!). We arrived here with our bags, sight unseen. Who knows what kind of place we might have walked into! But it was, truly, love at first sight. Strolling the quiet shoreline and looking out at the endless Gulf from the giant deck, we promised each other we’d buy a place at Green Reef. We waited and waited for a unit to come available (they rarely do at Green Reef), and in the meantime looked at second-choice options up and down the Gulf shores, from Panama City to Pensacola. But Green Reef and Destin always had our hearts. We kept returning as guests, including during some difficult times. After I faced breast cancer and a tough chemotherapy regimen, plus a big move from Chicago (what was I thinking?! ), staying at Green Reef, beside the sea, really helped me to feel normal again. Twenty or so cancer-free years later, a unit finally came available at Green Reef. Our dream came true in April 2004 and it’s been a whirlwind, rewarding time in our lives ever since. I loved hand-selecting all the details at Green Reef 19, from the outdoor furniture to the bed linens to the artwork and antiques. From the beginning, we wanted this to feel like home for our guests—because that’s what it is for us. Our handyman Todd and our wonderful cleaning crew keep Green Reef 19 looking as beautiful, if not more so, than the day we were finally able to buy it. And the circle continues! Many of our guests come back year after year, just as Bill and I once did. Kids have grown up collecting family memories at our home and on the Destin beachfront. Perhaps someday, one of those kids will grow up to want to be the owner of Green Reef 19. But for now, we’re holding on to it for ourselves (and for you, of course). Please please contact us with questions about Green Reef 19, or to book your Destin beachfront vacation.